Since 1403 there have been hundreds of men who have held the office of Lord Mayor of Norwich, but up to 2017 only 17 women. In researching the subject the author was able to interview nine surviving former Lady Lord Mayors, who shared with her details of their backgrounds, families, careers and experiences in their mayoral years. Among them, Felicity Hartley, in office 2006-07, came from County Durham to take a job at the UEA, while one of her sons, Christopher, became her consort. Brenda Arthur, in office 2015-16 and who for a time lived in Wymondham, is now in charge of the Norfolk and Norwich Arts Festival, while Evelyn Collishaw, in office 2009-10, was particularly proud that in her year women were sworn in as freemen of Norwich for the first time. Brenda Ferris-Rampley, in office 1994-5, was honoured that in her term the 800th anniversary of the Norwich Charter was celebrated, but she was devastated when fire ravaged the Central Library and then the Assembly Rooms. Much research had to be undertaken on the Lady Lord Mayors, who had since passed on, and in this respect the Norfolk Record Office and Archant’s newspaper library were most helpful. Many of the ladies had originated from far and wide, for example The Wirral and Sussex, though six were born and bred in Norwich. 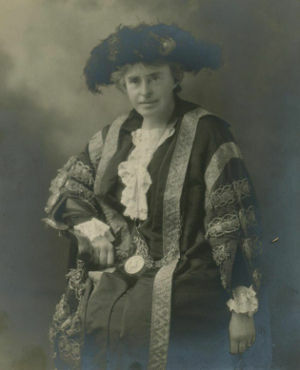 Ethel Colman, the daughter of mustard giant Jeremiah James Colman, became the first Lady Lord Mayor of Norwich and, indeed, of Great Britain, when she was installed in office on November 9 1923, while Ruth Hardy, the daughter of a rabbit warrener working for the Colman family, enjoyed the Festival of Britain celebrations, both in the city and in London, and meeting Royalty during her year of office 1950-1951. Jessie Griffiths, in office 1969-1970, was the daughter of a Corporation carpenter who became the first woman leader of a political party, in this case the Conservatives, in the history of Norwich City Council. Born to Jewish parents, Valerie Guttsman, in office 1979-80, had earlier escaped the Nazis from occupied Czechoslovakia to at first find work in Scotland and her unpublished memoirs are held by the Norfolk Record Office. On the other hand Lila Cooper, in office 1995-96, was an elegant lady who was born in Surrey, but after moving this way trod the boards for Norwich’s Great Hall Players. Related features, like the traditional mayoral robes, the priceless regalia, the civic coach, which has not been used for five years because of maintenance costs, were all mentioned, as were many special events, among them the Lord Mayor’s procession, Royal visits and the annual services for the Battle of Britain commemoration and Remembrance Day. And, of course, the magnificent City Hall, opened by King George VI in 1938, was not forgotten. Juliet Tregaron, who was in the chair, introduced the speaker with Bruce Blackney giving the vote of thanks for a truly fascinating evening. The next meeting will be on April 25 when Andrew Carpenter will speak about the Wymondham area from earliest times to c.1400. Non-members (£2) are welcome. For more information about Phyllida Scrivens' book, visit her website at myladylordmayor.wordpress.com/.